New Delhi: On Sunday, the Union Cabinet appointed Mr. Piyush Goyal as the new Rail Minister. 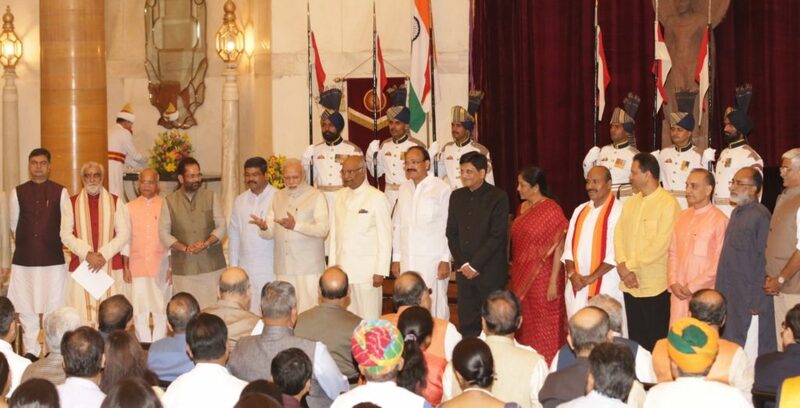 He took oath of office and secrecy as Union Minister at the Rashtrapati Bhavan, yesterday. Piyush Goyal is the third Rail Minister of Modi Government who took charge from Suresh Prabhu. Currently, the Minister of Railways & Minister of Coal in the Government of India. He was earlier the National Treasurer of the Bhartiya Janata Party (BJP) and also a Member of Rajya Sabha, yet. 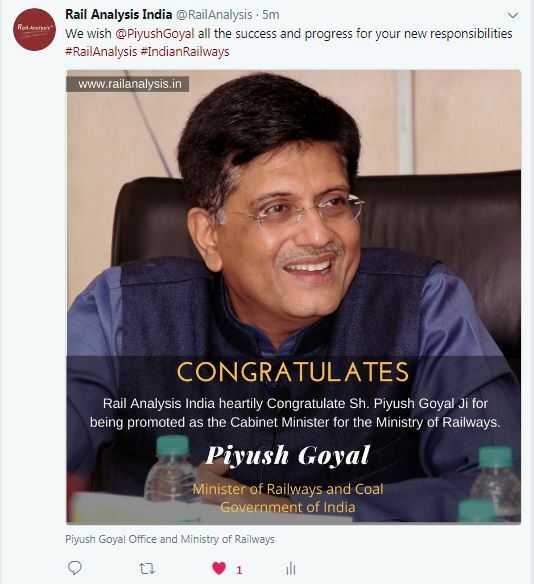 Piyush Goyal headed the Information Communication Campaign Committee of BJP and further oversaw the publicity and advertising campaign of the party including the social media outreach for the Indian General Elections 2014. In his 33 years long political Career, he has held several important positions at different levels in the BJP and is in the National Executive of the Party. He was also nominated by the Government of India to the prestigious Task Force for Interlinking of Rivers in 2002. He has had a strong academic record – All India second rank holder Chartered Accountant and second rank holder in Law in Mumbai University. He has participated in Leadership Programs at Yale University (2011), Oxford University (2012) and Princeton University (2013). He was a well-known investment banker and he has advised top corporates on management strategy and growth. He earlier served on the Board of India’s largest commercial bank, the State Bank of India and Bank of Baroda. Currently pursuing the Owner/President Management (OPM) Program at Harvard Business School. His father Late Vedprakash Goyal was Union Minister of Shipping and the National Treasurer of the BJP for over two decades. His mother Chandrakanta Goyal was elected thrice to the Maharashtra Legislative Assembly from Mumbai. He is married to Seema, an active social worker. He has two children – Dhruv, working in New York, and Radhika, studying at Harvard University, USA. His ministry has been able to electrify 13,134 remote villages by April 2017 out of 18,452. He also has added another 60 GW capacity in his tenure of two years as compared to addition of 240 GW in last 65 years. He launched the Ujwal DISCOM Assurance Yojana (UDAY) to revive debt ridden Power DISCOMS of the country in 2015 and has managed to sign MOU’s with 27 states as of April 2017. He revised the Government’s target of 20,000 MW of solar power by 2022 to five times (i.e. 100 GW). On 5 July 2016, during the second cabinet reshuffle of the Narendra Modi ministry, Piyush Goyal took over as the Minister of Mines (Minister of State with Independent charge) from Narendra Singh Tomar. Indian Railways has grown a lot in Prabhu’s Tenure. He has initiated various new Railway Projects which will prove to be a boon for the Indian Economy like the High Speed Rail Project, Station Redevelopment Project, RRTS Project etc. He is well known for his easy accessibility to the public, which not only acts as a deterrent to the bureaucratic delays and corruption in the functioning of the Ministry, but also encourages new ideas and view-points. 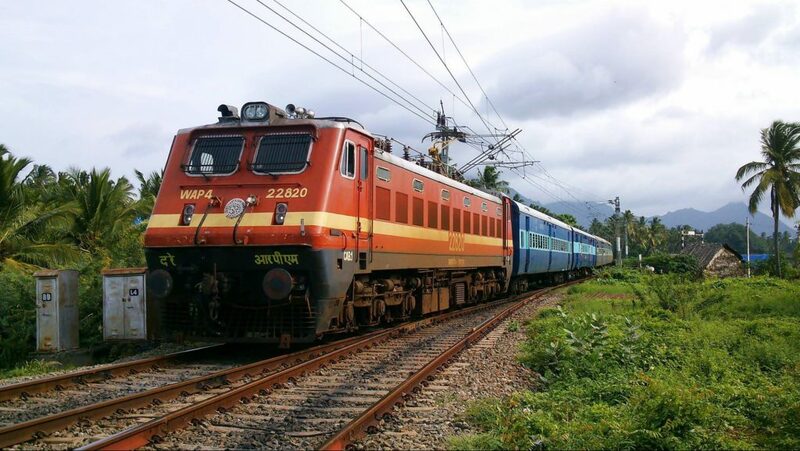 He successfully implemented the real time customer complaint resolution mechanism through Twitter, which has given voice to the passengers of Indian Railways. He introduced innovative customer friendly measures ranging from E-catering, water vending machines, Clean my Coach Service, ticket vending machines and significantly improved coach designs. He has also partnered with Google to provide high speed Wi-Fi at railway stations. He successfully led Railways to achieve a quantum jump in infrastructure creation spending and improving connectivity. Railway is also focusing on harnessing wind power and other non conventional energy sources, under his leadership.